As some of you have already seen in game there's a new April Fools Collection coming as part of a few things to do over April Fools. The Collection is a Canned Snake, a Dribble Glass, Fake Vomit, a Finger Trap and Itching Powder. This gives the very nice reward of 200XP and a Debris Cactus. Just like the previous St Patrick's Collection and Spring Collection these items can drop from ANYTHING you do on yours, or your neighbours homestead throughout the whole of April. There's also a series of five April missions, for all the info click HERE. We'll be bringing you more information on missions and other items as we get it! All that walking get your worn out around the ol' stead? Well give them piggies a break and hitch a ride from the new rideable horses! 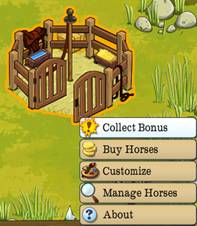 After you have built yer Corral you can purchase a horse from the menu option. Once placed it will take 4 clicks to grow the horse to adult (rideable) stage. Yer adult horses will stand next to a hitching post with a saddle on them to indicate that they are now rideable. 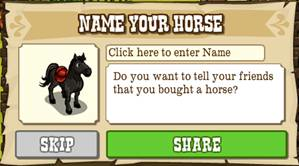 Now just click on the horse and select "Ride Horse" from the options menu. As you do chores whilst riding yer horse yer horse will gain XP and level up. To dismount from yer horse just click on the horse's hitching post and select "Dismount" from the options menu. Treats are boosts that can be fed to horses to double XP for the next few tends. At the moment these are only available as a horseshoe purchase. 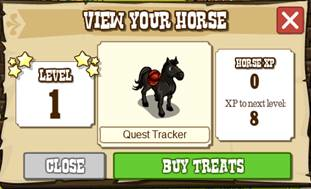 Buying treats work like boosts and will give an option to feed the horse right away. If the horse is “Boosted” with treats, it will glow. Zynga appear to be making a new promotional crossover with small business support website Intuit.com which will see the introduction of two promotional missions that reward a Building Ready bonus. The mission details are HERE and you may spot the reward is a Building Boost. When clicked with, this new boost will make any building instantly ready, in other words make its Daily Bonus ready to collect straight away. We'd love to hear your thoughts on promotional missions like this and crossovers on our Facebook Page. The Law of Diminishing Rewards! It would appear that the recession is hitting home on the Frontier as well as in real life... as the reward levels for some of the hardest and nastiest missions in the game have been cut. Master Farmer II - Plant and Harvest 300 Flax. Master Farmer III - Plant and Harvest 1500 Peanuts. Found a Town II - Collect 500'000 coins. Found a Town III - Collect 1'000'000 coins. These are nightmare missions for differing reasons. The Farmer missions because they eat up space and take so loooooooooooooooooooooooooooooong to complete, with having to PLANT not just HARVEST the crops it took a seemingly endless time. As for the founder missions, the nightmare there was simply the fact that once you hit the right bank balance it took it all away, flinging you back into bankruptcy and leaving any players who hadn't planned ahead woefully short on cash... at which point you could be sure the game would throw a new mission at you that needed spending bucketloads of coins. So, as you can see all horseshoe rewards for new players have been cut by 80%... So if you get a friend or family member who asks about the rewards, here is the answer, it's not a glitch or a problem in the game, the rewards have been cut from what older players will remember. Is it because with expanded homesteads it's easier to do? Is it because they're not as hard as Zynga thought they would be initially? Remember to share your thoughts on our Facebook Page. Will We Be Visiting Oregon Soon? 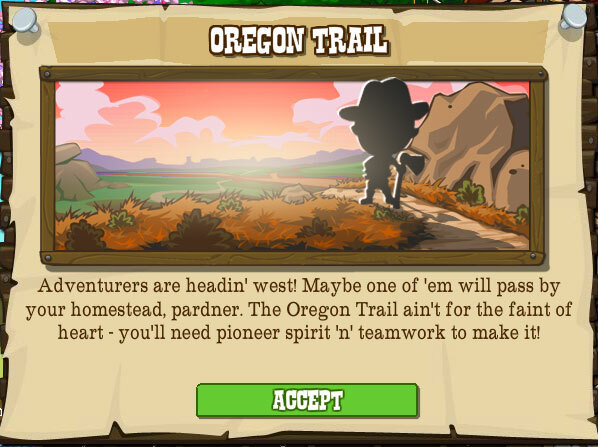 It seems another traveller might visit one day and, instead of bringing the pox, will bring an invite to Oregon! Interestingly it mentions teamwork so possibly co-operative play? Who knows, it may still be some time before we see this for real, after all we've had those signposts since the game started last year but this is the first time one has seemed to be a step closer, so it may just be appearing in the next few months! I see trees of green... and new injured animals too! We may all have seen the trees in Frontierville have returned to being green but their change signals more than just a colour change! We're going to be seeing new injured animals and new missions... plus another collection dropping with the frequency of other recent specials such as the New Year Collection and the St Patrick's Day. Now, onto the new animals! They need caring for with seven Fuzzy Blankets, again requested from friends. It works much the same way as an injured animal. A Bear Cub or a Chinchilla! Feeding them seven Juicy Berry's each will then "heal" them and make them a tendable animal on your farm. As usual the berries are requested from friends. Along with the new animals doing pretty much anything will pop up some familiar collectibles... The Spring Weather Collection that was attached to the Spring Groundhog are having their own version of Groundhog Day and are returning with a new Reward for trading them in, a Mud Puddle and 50XP. Any other info if and when we get it! But if you have anything to say about the new animals or missions be sure to visit our Facebook Page and have your say. New Building - Doghouse and Old Farm Dog! Finkerton's Detective Agency Finds Lost Players?! Which Lady's Chest Do You Prefer? EXCLUSIVE!